The draft Egyptian constitution, which will be put to public referendum in a matter of weeks, comprises a major step forward in regulating the role of Islamic sharia and in allowing religious freedom, according to observers. The previous constitution was drafted in 2012 by an assembly dominated by Islamist figures, and was subject to frequent criticism by non-Islamists for its stance on religious freedoms and on the role of sharia law. The democratic process that followed the fall of autocrat Hosni Mubarak saw the rise of the Islamist Muslim Brotherhood to power, but following the ouster of the Brotherhood's Morsi from the presidency in July, a new roadmap was announced by the interim authorities. The controversial 2012 constitution, which had been approved by national referendum in December 2012, was suspended. "The new draft maintains the position of sharia in social conscience, but prevents any infringements on constitutional jurisdiction," Adel Ramadan, legal affairs official at local NGO the Egyptian Initiative for Personal Rights, told Ahram Online. "Having gone in the direction of achieving that balance, amending the articles related to the rule of sharia law to their current position in the draft was certainly a positive step." Egypt's new draft charter maintains the original phrasing of Article 2, the essential text that cites that sharia law is the main source of legislation. 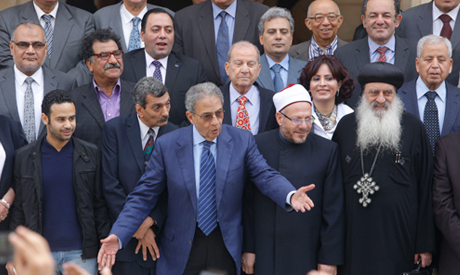 However, the mostly non-Islamist drafting committee, appointed in September by interim President Adly Mansour, has eliminated and modified the most controversial articles and text phrasings pertaining to sharia which were added by the 2012 assembly, and which were criticised at the time by many non-Islamist political figures. Ramadan, who has studied both drafts, believes the elimation of Article 219 has removed the perceived political authority of Al-Azhar, the country's highest Islamic institution, from the lawmaking process. "Article 219 posed a restriction on lawmakers," Ramadan said. "Removing it also helps eliminate possible conflict between sharia and constitutional jurisdiction." Nader Bakkar, spokesman for conservative Nour Party which was allied with the Brotherhood in 2012 and had strongly pushed for the inclusion of Article 219 at that time, said the removal of article in the amended draft had not reduced the role of sharia law. "The amended draft, while certainly giving more advantage to lawmakers than the old constitution, still maintains the essence of sharia and upholds the Supreme Constitutional Court's acknowledgement of its pillars, which Article 219 only reiterated." Bakkar explained that his party, which had one representative in the 2013 drafting committee, agreed to the removal of Article 219 only because the pillars of sharia law are defined "clearly" in the preamble for the new draft -- something that was missing in the 2012 charter. The 2013 preamble reaffirms the principles of sharia law as acknowledged by the Supreme Constitutional Court in 1985. Moreover, in Article 7 of the amended draft, which regulates the role of Al-Azhar, the part which stated that Al-Azhar's Supreme Clerical Committee should be consulted on all matters relating to sharia has also been removed. "The previous constitution gave political authority to an unelected religious body over state institutions," Ramadan said. Bakkar, who said that amendments relating to Al-Azhar were all made in agreement with the three representatives of the institution in the 50-member committee, believes that the amendments have actually strengthened Al-Azhar's position in the constitution. "Now, Al-Azhar as an entire institution, including the Supreme Clerical Committee, is now defined clearly as the only reference body in religious affairs. This will eliminate possible infringement by any political party who wish to take the matter of interpreting sharia into their own hands." In Article 81 in the section of the draft on rights and freedoms, a contentious sentence which stated that rights and freedoms may be exercised "as long as it does not contradict with any constitutional articles in the section on the state" was also removed. In 2012, the sentence was strongly criticised by rights groups and non-Islamist parties on grounds that it gave way to suppressing freedoms in the name of applying Islamic sharia. "The old Article 81 restricted the freedoms which were earned by the Egyptian people after the 25 January revolution," says Ramadan, the rights lawyer, referring to the uprising that toppled autocrat Hosni Mubarak in 2011. Bakkar, for his part, does not seem to be fazed by the omission of the sentence his party lobbied for in 2012. "We've made sure that the role of sharia law is established in the new preamble which sets the framework for the whole document," he explained. "The most important part is that the constitution still prevents the approval of any legislation that would contradict with sharia law." This, however, is still a source of concern for Ramadan. "While there is more than one school of interpretation of sharia law, governments and upcoming state institutions which would work under the amended constitution should still always uphold constitutional jurisdiction granting the right to practice freedoms," he said. Countries do not have religions because the citizens have many different religions. Some countries are the seat of a religion like Saudi Arabia for Islam, The Vatican for Catholicism, Israel for Judaism...Even those countries do not and should not have a religion. It lacks any common sense to assign a religion to a country full of different people with different religion or no religion at all.It seems bro me to be part of the constitution of radicals who are afraid and thus reluctant to grant freedom of thinking to the population of the country. I think the official religion statement should be eliminated from the constitution of all countries. The removal of Article 219 and the elimination of any LEGISLATIVE role for Al-Azhar are certainly steps in the right direction. While the amended text is not perfect because it allows military trials of civilians and does not subject the military to civilian oversight, I call on fellow citizens to vote 'yes' for it, so that they would not play into the hands of the brotherhood. Also prolonging the transitional period would subject Egypt to GRAVE DANGERS. Farhan, English is spoken in roughly 25% of the world. Here is some background on the English language for you. Modern English, sometimes described as the first global lingua franca,is the dominant language or in some instances even the required international language of communications, science, information technology, business, seafaring,aviation,entertainment, radio and diplomacy. Its spread beyond the British Isles began with the growth of the British Empire, and by the late 19th century its reach was truly global.Following British colonisation from the 16th to 19th centuries, it became the dominant language in the United States, Canada, Australia and New Zealand. The growing economic and cultural influence of the US and its status as a global superpower since World War II have significantly accelerated the language's spread across the planet. English replaced German as the dominant language of science Nobel Prize laureates during the second half of the 20th century. English equalled and may have surpassed French as the dominant language of diplomacy during the last half of the 19th century. A working knowledge of English has become a requirement in a number of fields, occupations and professions such as medicine and computing; as a consequence over one billion people speak English to at least a basic level. It is one of six official languages of the United Nations. One impact of the growth of English is the reduction of native linguistic diversity in many parts of the world. Its influence continues to play an important role in language attrition. Conversely, the natural internal variety of English along with creoles and pidgins have the potential to produce new distinct languages from English over time. Topmost is Mandarin with 14.1%, 2nd is Spanish with 5.85%, 3rd is English , 4th is Hindi with 4.46%, Arabic is fifth with 4.23%. Yeh English is global communitcation language but its not used all the time. So please stop being such a moron. Dear whoever you are, please stop writing in English. Your opinions as well as your way of writing is too poor.